Yesterday the Liverpool's Princess finally escaped dramatically forever. 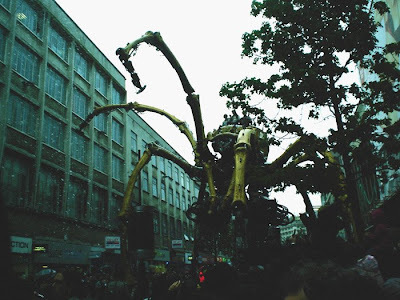 The giant spider (Fifty feet high, 37 tonnes) was wandering around to the streets of Liverpool for a while, making everybody feel amazed! The music accompanying her and the wet cloudy weather were making the scenery so real and atmospheric... Quite an addictive show, as many people -thrilled by the sight of it, even though it was cold and extremely busy, were following her around for hours! I've never seen so many people before in the streets of Liverpool. 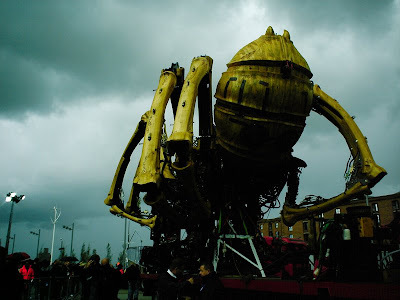 A marvelous creation brought by the French company "La machine" which will stay forever in the minds of the people who had the luck to experience a bit of the magical story! 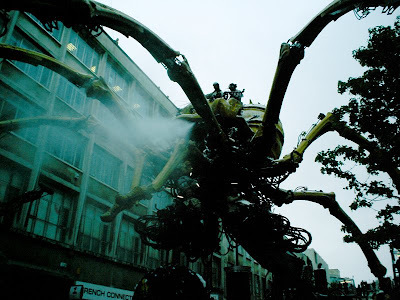 Don't forget to have a look at the previous magnificent Artichoke production in London "The Sultan's Elephant"